The recent census found 1.2 million people live in the New Orleans Metropolitan Area, down only 7% from the 1.3 million in 2000, but the makeup of who lives here and the driving forces of the economy will shock you. 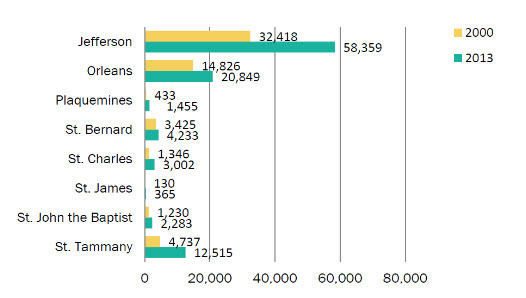 What Jobs Drive The Economy? Government, hotels / restaurants and hospitals are where the jobs are in Orleans Parish, and in that order. 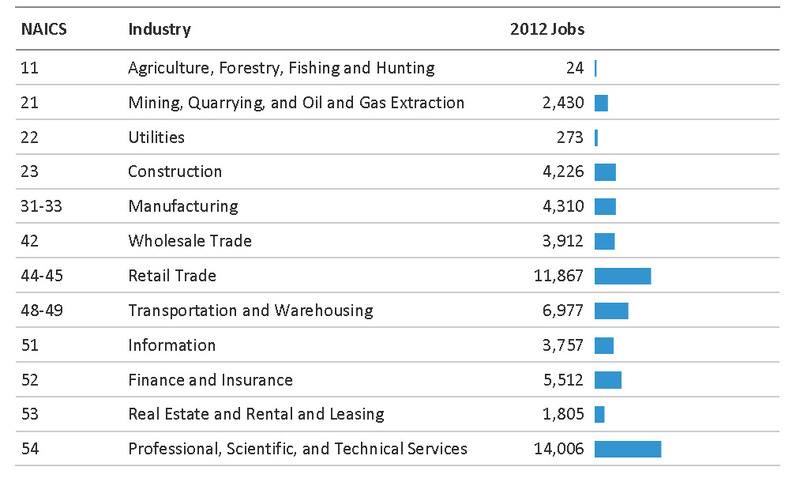 The most jobs per industry are shown in the chart below. The latest technology divides each industry by NAICS code, the North American Industry Classification System, designed by the Office of Management and Budget in 1997 to replace the outdated SIC codes. 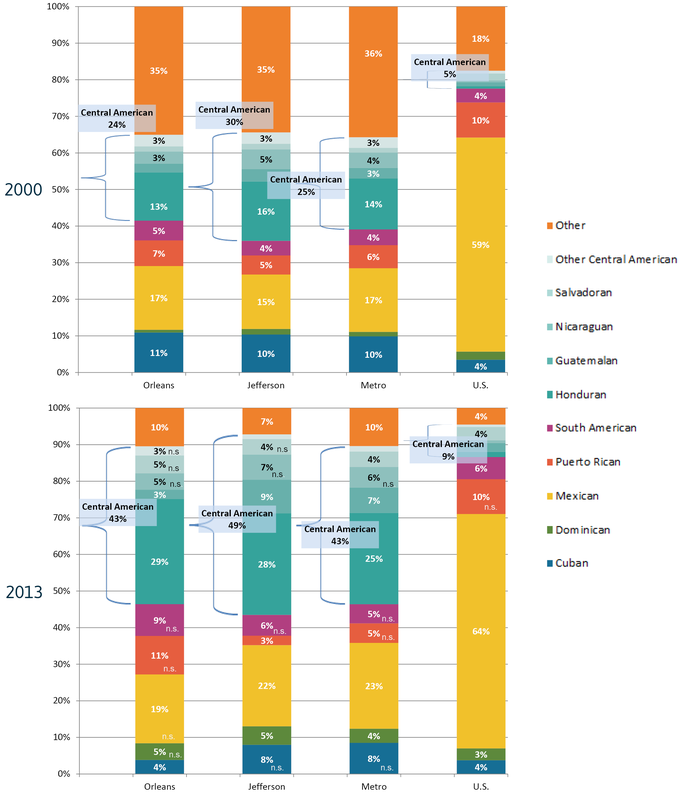 The chart shows the tourism industry now is the driving force of the economy, with the New Orleans Convention Center bringing in tourists, who spend their money in hotels and restaurants that employ most of the residents who spend their disposable income that further drives the economy. Economists call it a Multiplier Effect. The New Orleans’ tourism industry saw 9.28 million visitors in 2013, an increase from 9.01 million in 2012, but visitors spent $6.47 billion, an increase of 4.5% from 2012, and a 45% increase compared to pre-Katrina peak of $4.5 billion spent in 2003. We have almost as many people living here as in 2000, but the culture has changed. Since 2000, the Census shows that New Orleans has 30% fewer African Americans, 4% fewer Whites, and the major growth demographic has been a 40% rise in the Hispanic population-and that is just in Orleans Parish. The increase in the Hispanic population is highest in Jefferson Parish with almost 70% growth. Hondurans are 29% of the Hispanic market, which is 7 times the norm for the United States. New Orleans is almost 300 years old, so there has been lots of time for generations to pass down their wealth in the form of real estate. Inherited wealth is managed vastly different from created wealth, since there is a hesitancy to take risks such as improve property and adapt to changing uses, which is why there are thousands of properties in New Orleans that have not been put to “the highest and best use”. The impact is that opportunities exist to create value where non existed before. 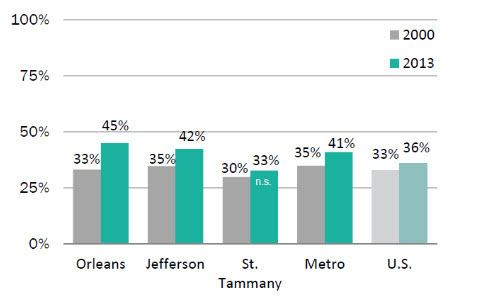 The proof of inherited property can be seen in the chart below showing Orleans Parish leads the pack with 45% of the properties having no mortgage, compared to an average of 36% in the United States. A new crop of businesses with be created to meet the needs of the exploding Hispanic industry, with growth in ethnic grocery stores, restaurants and clothing stores. Orleans Parish with its high rental demographic will continue to need new apartments, with developments needed in the downtown area and also in New Orleans East. Older apartments will see reduced rents and will be transformed into shopping centers as new apartments draw tenants. Real estate will experience a change to “highest and best use” with properties being reinvented into new and creative uses. There will be new businesses created to serve the tourism industry that we haven’t thought of before. Ideas like Uber will flourish. Personal vacation applications with all sorts of features will be created to make the New Orleans experience more dynamic. Technology will be utilized to serve convention goers. For more information on New Orleans’ driving forces, read our article called Economic Drivers in New Orleans-The Petrochemical Industry, and select from over 150 articles on commercial real estate at Louisiana Commercial Realty website blog.